On August 10, 2017 some American diplomats stationed in Cuba complained of some auditory and some vestibular symptoms. Recently one of our other editors at HearingHealthMatters.org, Brian Taylor, reported on some opinions from Dr. Jerry Punch about the possible cause. Ultrasound, infrasound, and other sources have been proposed as the possible cause of these complaints. There is no evidence in the literature that ultrasound- sound above our normal auditory range- could be the culprit. The harmonics of this potentially offending sound would be even higher. There is evidence however, that the hair cells in our vestibular system can transduce sounds even higher than 20,000 Hz, but the dynamic range would be small. In short, ultrasound, other than perhaps heating up skin tissues slightly, would have no auditory effects. There have been some suggestions that “intermodulation” distortion products of this ultrasound could be in our audible bandwidth (e.g., 2F1-F2) but the amplitude of these combination tones would be quite low relative to the ultrasound primaries. Turning our attention to sound that is below the range of human hearing- infrasound- this may be slightly more possible as a culprit, but also unlikely. Low frequency sound can indeed travel through long distances and don’t “acoustically see” obstructions such as brick walls as easily as do higher frequency sounds. That is, while 1000 Hz (about two octaves above middle C) may bounce off a wall of a building and not heard by its inhabitants, 100 Hz or 10 Hz is more likely to pass right through the wall. 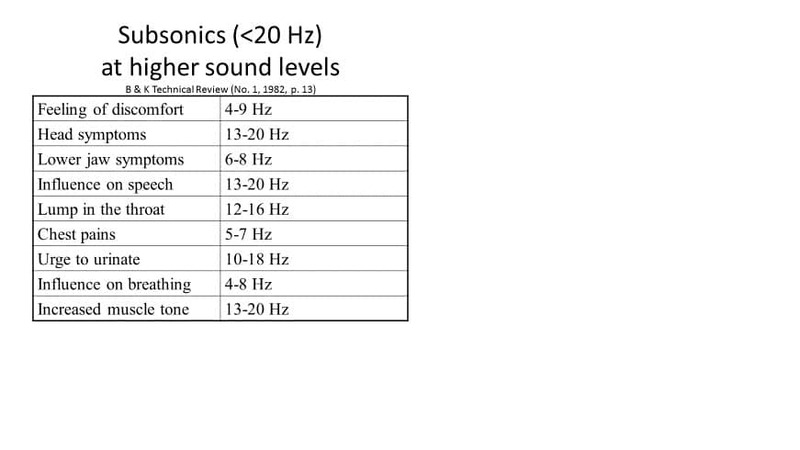 Very low frequencies or infrasound below 20 Hz have many non-auditory side effects but as far as the literature is concerned, does not cause hearing loss. Some of these effects may be a feeling of discomfort, a lump in the throat feeling, or even an increased urge to urinate. A table at the end of this blog from a Bruel and Kjaer Technical Review (1982) provides a nice listing. While these effects are tactile (and bothersome) they do not cause hearing loss. 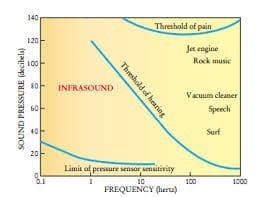 And like ultrasound, even if there are higher frequency harmonics (within our auditory bandwidth of hearing), they would be easily heard and not be infrasound. So…. I am not sure what has caused these diplomats to report some of these auditory sensations. We can’t rule out airborne ototoxins that they may have come in contact with and while this does sound a bit like James Bond, this etiology is more likely than an infrasound or an ultrasound attack. Or maybe…. The diplomats were at a great party the night before and are all suffering from TTS and hangovers….? Nicely stated Marshall. A reasonable explanation.